My post on citation got far more engagement than nearly all of the things I have posted over the years, so I thought I would return to the scene of the crime/post. While many academics agreed whole heartily with my take, more than a few did not including folks I respect a great deal. What were their perspectives? Citations are a lousy measure, one with much bias, of academic relevance/achievement, etc. People would rather be contacted so that they can provide the latest version of the paper, rather than something that might be half-baked, wrong, or incomplete. People worry about being scooped or plagiarized. So, my quick answers are: yep but the game is not going to change tomorrow; our work is almost never finished (sometimes we even put out new versions of books seven years later when countries behave differently than we predicted, sort of); well, damn. Ok, let me explain each a bit more, especially the last one. 1) Yes, citations are imperfect. They can be gamed as people cite themselves, organize citation cartels so that friends cite each other, women get cited less, Canadians get less citations, etc. But they are things that can be measured (yes, we emphasize thing that can be measured even if they are imperfect measures) and that one can try to adjust for bias. The stuff I just cited is the first step towards figuring out how to weight things to control for gender/racial bias. So, we are kind of stuck. We can de-emphasize the role of citations and h-indexes in our own evaluations of candidates for jobs, tenure, awards, etc, but we cannot just change how the profession works and what deans/provosts and others care about. So, voluntarily impeding citation of one’s work is not quite professional suicide, but it is not a great idea for junior folks. 2) People would rather that their best/most recent versions be cited. That is sensible for folks who have no clock (tenured folks), but I am not sure it makes sense for junior faculty and graduate students. They have limited time to get citations before going out on the market or going up for tenure. Deliberately making it harder for people to cite them is simply unwise. Yes, you can put stuff on your paper saying “contact me and I will provide the latest version.” But that assumes that people have enough time and attention to the stuff they find to email, wait for a response and track all of that. Junior folks have enough of a balancing act without imposing upon them the need to contact scholars for permission to cite. And older scholars might also be very busy, so they will just move on to papers they can cite. I also think very strongly that perfect is the enemy of the good enough. 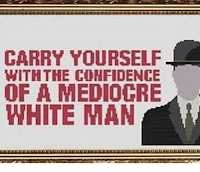 Now, I got pushback from a couple of female scholars who are super-productive and super-cited, so they don’t have a perfection problem (well, maybe they just produce refined work quickly). 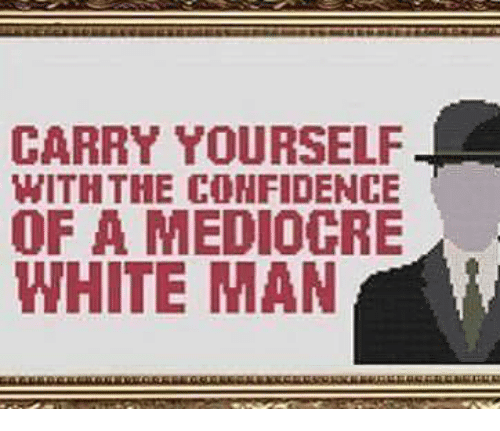 The meme about having the confidence of a mediocre white guy…. that studies have shown (studies I have heard of, not done or read myself) that women are less confident about putting their stuff forward because of how men have treated them in the past. So, it might be that women are more concerned about getting their best stuff out there. Again, this is just a guess. 3) This gets to a slightly different issue–it is not so much about “do not cite” but posting articles. People said that they post abstracts, not papers, or not thing at all as they do not want to get their ideas stolen. What is most striking here and also in category 2 is that most of the people making these arguments are women. Aha, there are power dynamics that I am less aware of because I am a while male heterosexual. I don’t mean to make light of this–there are different realities for me than for women, for LGBTQ+, for African-Americans, for Latinx scholars. And I just didn’t think this is much of a threat. I do wonder if the next time there is a survey of the status of women and of other marginalized groups in the profession, they should ask about this. 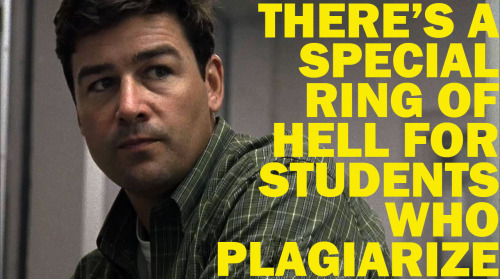 Are these people facing a greater risk of plagiarism? Of having their ideas stolen? I have no idea. However, it seems to me that the best way to prevent people from stealing one’s ideas is to make visible claims to that idea–to circulate widely, rather than hide, what one is working on. That way, if someone tries to steal the idea, it will be easier to track which happened first–your discussion of your idea or the thief’s (update: I have been informed that the timestamp of when a paper was uploaded was used to resolve a plagiarism despite). As or more importantly, our job is to not just create knowledge (learn stuff about the world) but to share it. It seems wrong to me to make it harder to share it. While the primary source of bias in citation is surely the sexism of men and because of how patriarchy plays out in the profession, I can’t help but think “do not cite, do not circulate” is a dynamic that might be also causing women to be less cited (just as women self-cite less). Unlike the more institutionalized sources, this is one pattern of behavior that is relatively easy to change. And, yes, I am aware that I am mansplaining sexism to women. Sorry. I feel more guilty about the manel I was on today. Anyhow, I am glad we are having this conversation because even if I am wrong, it is better talk about this stuff than just leave it unquestioned. I love the idealism in this, and in a better world I would agree. The problem is, this isn’t what happens when women’s ideas (or anyone’s ideas) are stolen. They don’t just copy your idea and present it as their own. They take your work, add two small things to it, and then claim those two small things are the most important part of the new work they are presenting. They would never have had the idea without your work. But they minimize your work as being unimportant. And the problem for women is, sexism means men and even other women will give the thieves the benefit of the doubt when they’ve stolen from a woman, when they would push back if they’d stolen from a man. Sexism means people will say to the women: Obviously it wasn’t that important of a work, otherwise why wouldn’t he just cite it? Your work was out there and wasn’t getting attention; isn’t that evidence enough that it wasn’t important? Etc. Saying, “Well yes but this work I’ve been putting out there doesn’t represent the finished product” doesn’t gain women anything. People will chortle and ask why they were publishing unfinished work. People will ask why they put their work out there if they didn’t want people building on it, which is framing the issue wrong and missing the point entirely. Like so many other situations women face, they’re damned if they do, damned if they don’t. What works well for a man — in this case, publishing their ideas early and often and disseminating them far and wide — will not lead to the same outcomes for a woman. It’s not academia, but see this story for an experience from a man’s point of view signing his work as a woman, for two weeks. And then read the same story from the woman’s perspective, too. She had no doubt what she was facing. She already knew from personal experience that things didn’t work the same for her as they do for men. I like where your heart is at. But it is important to consider why women’s approaches might not mirror men’s, and incorporate the additional problems they face into any solutions you propose.